Justin Adams (Laertes) and Graham Michael Hamilton (Hamlet), Hamlet, directed by Joseph Haj, Folger Theatre, 2010. Photo by Carol Pratt. The Shakespeare’s Globe production of Hamlet is on tour–heading to every country in the world–and it’s stopping at the Folger Shakespeare Library later this month. Therefore, we thought this would be an opportune time to revisit an invaluable teaching resource created by the Folger, the Insider’s Guide to Hamlet. The Insider’s Guide is a multimedia experience with video clips from actors that accompany the featured lesson plans. 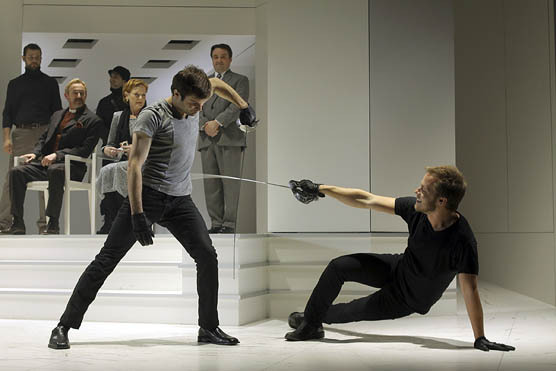 These videos, which are based on Folger Theatre’s 2010 production of the play, highlight Hamlet‘s themes, characters, and plot–perfect for students encountering the play for the first time or those seeking a refresher course. Here’s the video playlist for the Insider’s Guide, but visit our website to see the associated lesson plans. What are the resources you use to teach Hamlet? Let us know in the comments.